Abu Dhabi: Mangalore cup 2019 (Season-7) cricket Carnival and DANCPIRATION was held under the auspices of the MCC (Mangalore Cricket Club) at Sheikh Zayed International Cricket Stadium ground, here. MCC Vice President, Yahya Abbas MICCO; inaugurated the event, he said ‘The power of the human will to compete and the drive to excel beyond the body’s normal capabilities is most beautifully demonstrated in the arena of sport. It doesn't matter how good you are. Sport is all about playing and competing. Whatever you do in cricket and in sport, enjoy it, be positive and try to win’ ’He added. Sheikh Zayed international cricket stadium, turned out to be a packed-house on Friday night, spectators observed a two-minute silence for over 40 CRPF soldiers who died in abhorrent and dastardly terror attack in Jammu and Kashmir's Pulwama. MCC President Latheef KH said ‘We are deeply saddened for the loss of lives. Our heartfelt sympathies are for the families of the soldiers who lost their lives’’. Matthew Boucher CEO of Abu Dhabi Cricket (ADC) witnessed Mangalorean cultural event and cricket match. He had congratulated MCC President for organizing excellent community cultural event & expressed his pleasure to host Mangalorean community at International Cricket stadium. Overwhelmed by the amazing cultural events; Even in England we wont be able to witness such variety of cultural dances’ he added. More than ten thousand spectators turn out to see the one of the biggest NRI Cricket Tournament and cultural carnival of the year. 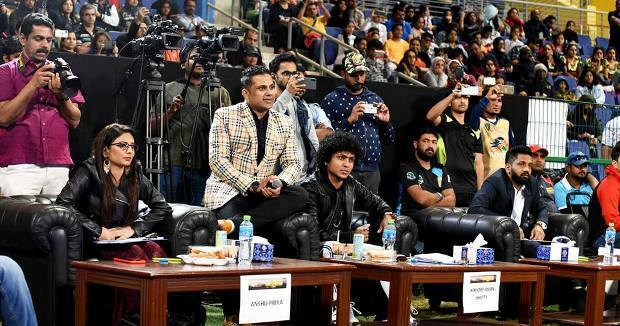 All the cricket communities came across from the seven emirates of UAE; were enjoying the splendid performance at Sheikh Zayed international cricket ground. As many as 14 indian teams from places across the UAE Participated in the event. several sixes and super catches enthralled the spectators from time to time forcing them to jump out of their seats breaking in to cheers and applause. Mesmerized by the dance performances, the Indian audience were seen capturing the moments in their camera mobile phones and cheering the performers. ABCD STAR, Dance India Dance fame Celebrity Judge Kishore Aman Shetty, ETV fame Celebrity judge Anshu Priya, yathish amin were the judges for the cultural carnival. MCC Organizers selected following 14 teams for the tournament: MK Boys,Paris Kitchen, Reliable Riders, Shabiya Warriors, Mangalore Indians, Worriors Kateel, Abone CC, Aims Cricketers, Eleven Warriors, KFC Strikers, Al Sitara, Black Caps, Sumtech Raising, SMGT Musffah. All the participating teams played to their best attempt keeping the scores and sprits very high. ‘Steps& Strings’ Music, Dance, Arts and Events institute children performed dazzling cultural dance. Cricket match and kids dance went hand in hand with the huge applause from the crowd. During the presentation ceremony MCC President Latheef KH expressed sincere gratitude to Sheikh Zayed bin Sultan Al Nahyan founder of UAE and other rulers for their everlasting support towards expatriate community. MCC President Latheef K. H Kakkinje honored the guests and sponsors with memento. Sahil Zaheer – RJ 98.3 FM flew all the way from india as a Master of the ceremony, he had succeeded in maintaining the energy of the crowd till the last moment. In the finals battle Abone CC won against won against KFC Strikers . KFC strikers turn out to be the Runner-up of the tournament. There were many Trophies in following categories: Man of the match in finals, Man of series, Best All-rounder of Tournament, Best Batsman of Tournament, Best bowler of Tournament, Best caughter of Tournament, Best fielder of Tournament, Best Keeper of Tournament, Hatrick wicket taker Man of the match award in each league matches, Best bowler, Best Keeper, Best Fielder, Best All-rounder, Best catcher etc. Spectators received Gold Coin, mobile phone, Tab and other attractive prizes under coupon lucky draw. Arwa, Almarai products, Coco-cola, seba med, Pediasure, put up their kiosks and freely distributed their products to all spectators to support the tournament under their corporate responsibility & social commitment ethos. Face painting for kids and other sports activities were also organized for families. Sooraj Prabhakaran. Manager-Medical Centres at Ahalia Medical Group Hospital team conducted free Health checkup at the stadium for the spectators and teams. MCC President Latheef KH Royal Emirates extended heartfelt thanks to all the sponsor’s participated teams and crowd making this seventh season a great success. He remembered Ronlad pinto Managing director Hyssna international who have been supporting the touranament immensively, He also expressed sincere gratitude to Abu Dhabi Cricket (ADC) for its great patronage for allocating international cricket stadium ground for this event. ‘’Upcoming MCC tournaments details will be posted in www.mccabudhabi.com’ he added. Mangalorean cricket clubs successive seventh season was full of actions and excitement. Eminent social workers and NRI Business conglomerates were present during the presentation ceremony. Prize distribution and winding up ceremony was blissful with many delegates. Walter Almeda Managing Director Regal Furnishing & Storage System, Queen Victoria Award winner Safe Line Group of Companies Managing Director Mr. Aboobackar Kuttikol, Asif and althaf Managing Directors of Sumtec Multiline trading Mussafah, Akram Managing Director Al sitara group abudhabi, Rafeeq and Nooruddin Managers Bindarai & Partners, Joel Crasta Managing Director Broadway event Management. Shoukat Managing Director Petro Gulf, Shahnawaz Hakim Yousuf - Abu Dhabi Cricket (ADC). Mansoor Manager Crosswind, Santhosh Rai Ramee Group of companies, Sachin Broadway Event Management, Faizan Khatheeb, Mohammad Mansoor Ujire Operations Manager ENE Abu Dhabi Ports, Salam KH Honor. MCC Board members and executives were present on the occasion. Following esteemed companies joined hands with MCC to make the event great success. Hysna International, Regal, Safeline, Sumtech, Bindirai, UAE Exchange, Sanana Trading, step & Strings, Ramee Group, Broadway event management, Crosswind, Royal Institute of Music & Arts, Abu Dhabi Cricket.